Have you ever wondered if anyone pinned an image from your blog? I mean, aren’t you the slightest bit curious? Well, if you aren’t curious feel free to carry on with your day. If you are curious continue reading. I just realized that you can be a crazy stalker and do this with other people’s blogs. Don’t worry. No one will know, and I won’t judge you. Have a fantastic weekend, friends! I’ll be filling my belly with deep fried cookie dough and Brad’s grandpa’s famous pulled pork BBQ. Do you have any fun weekend plans? Have you eaten deep fried cookie dough? If you haven’t, you should. That’s awesome! I can’t believe I’ve been pinned. Thanks for sharing. Wow, that’s really interesting! The only thing pinned from my site was something originally from Pinterest in the first place… (rolling eyes). Thanks for sharing! Cool! That’s so neat! Thanks for sharing, I’m going to bookmark that now! It’s kind of like ‘googling’ yourself. But even better! I get a kick out of seeing my pics pinned. I haven’t checked for a while though so thanks for reminding me. 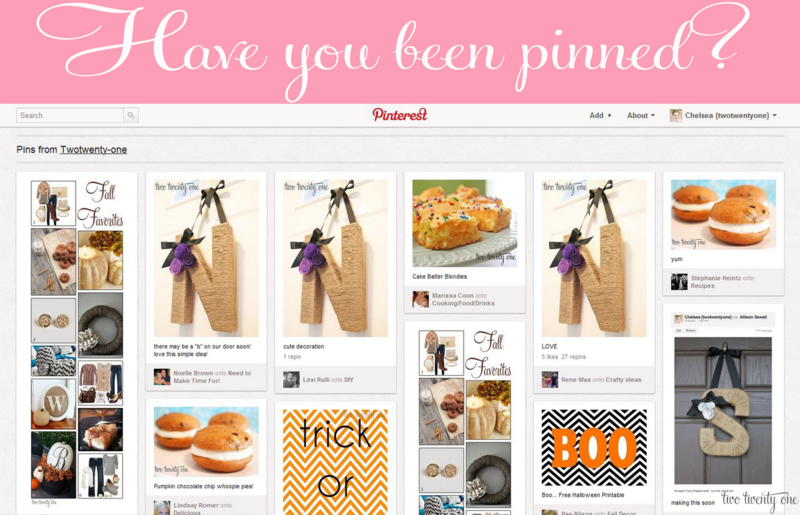 My Pinning & Singing Pinterest linky Party is on now so please stop by and check it out! I would be so thrilled if you could link up this excellent Pinterest tutorial. Thanks for sharing this info. I never knew you could do that!! Thanks for sharing. Wow! How exciting to discover that I’ve been pinned 13 times!!! Thanks! I was totally curious… thanks for the tip! Visiting from Serenity Now’s Weekend Link up! oh cool! i had no idea – thanks! Just got pinned last week, I’m so adding you!!! This is so useful! Not to mention fun. 🙂 I’m still just getting my feet wet with Pintrest and can use all the tips I can get ~ thank you! I’ve always wondered how to tell if anyone has pinned you! Thanks so much for sharing!! !